According to the United Nations International Telecommunications Union, almost 200,000 texts are sent every second. To put this into perspective, Twitter averages just 6,000 tweets per second. But from a compliance perspective, texts are risky. Prohibiting the use of text messages in your organization is not only unsustainable, but it also does not protect you from risk - it simply hides it where you can’t see and manage it. 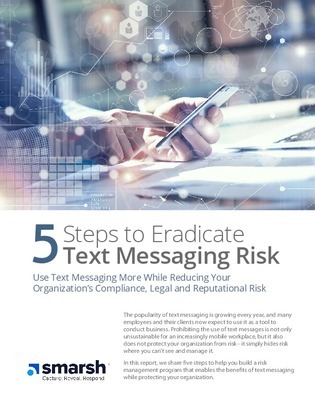 In this white paper, discover 5 steps on how to leverage text messaging more in your organization as a legitimate communication channel while reducing your organization’s compliance, legal and reputational risk.